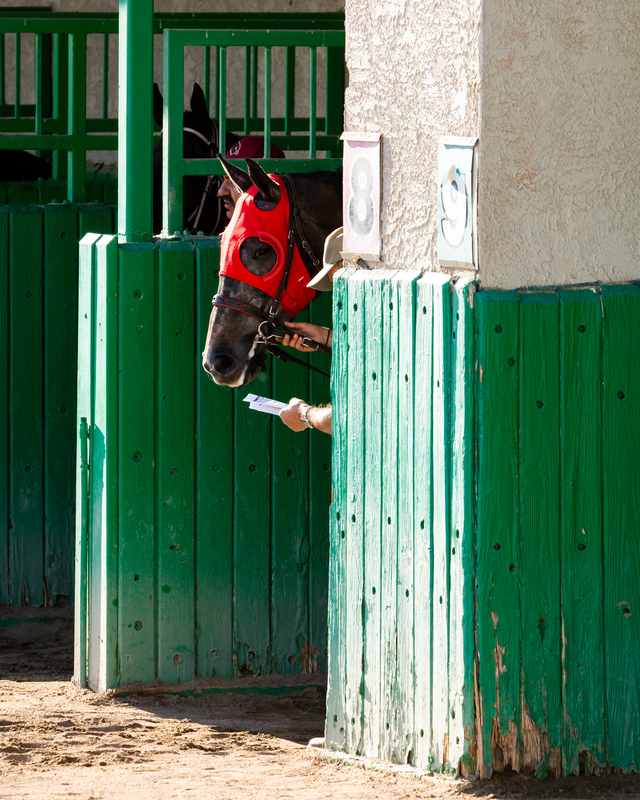 I am over in Phoenix, Arizona right now, so I took the opportunity to pay the local race track – Turf Paradise – a visit! Now, this is the fourth track I have been able to see here in the United States: Aqueduct, Golden Gate Fields and Los Alamitos the others. In comparison with those three, Turf Parade is small. In fact, much smaller. Why? No casino! 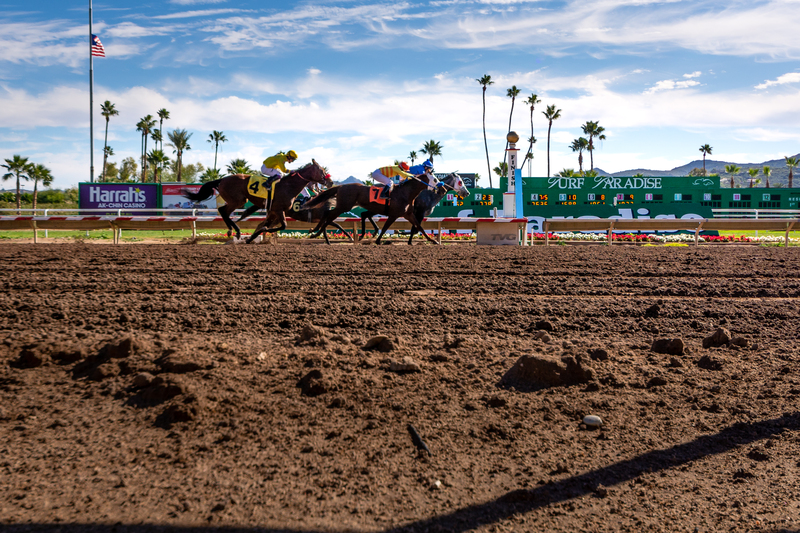 Turf Parade is quite a compact race track, located on the outskirts of Phoenix, easy to get to because of its proximity to Interstate Highway 17. In saying that, at the other tracks I felt lost… and the day became dull after the first few races. Well, mid-week racing, few people are keen to come racing on a Wednesday – it can be lonely onsite. 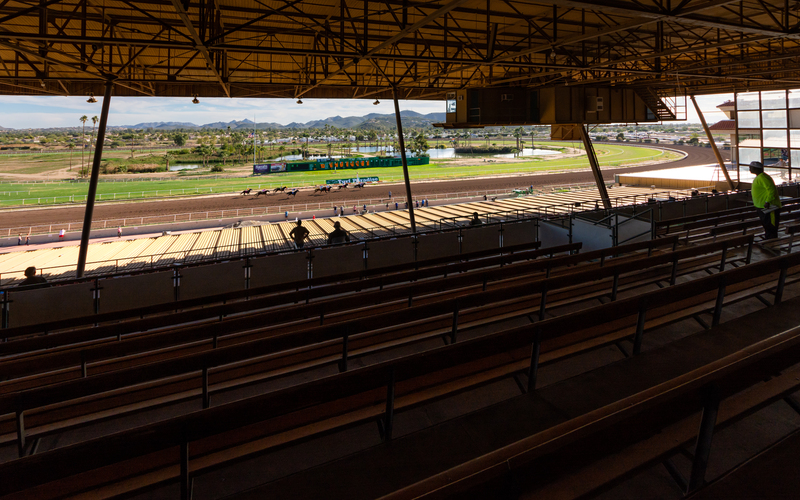 Casino-race-tracks are often huge places: wide and open spaces add to the feeling of emptiness. 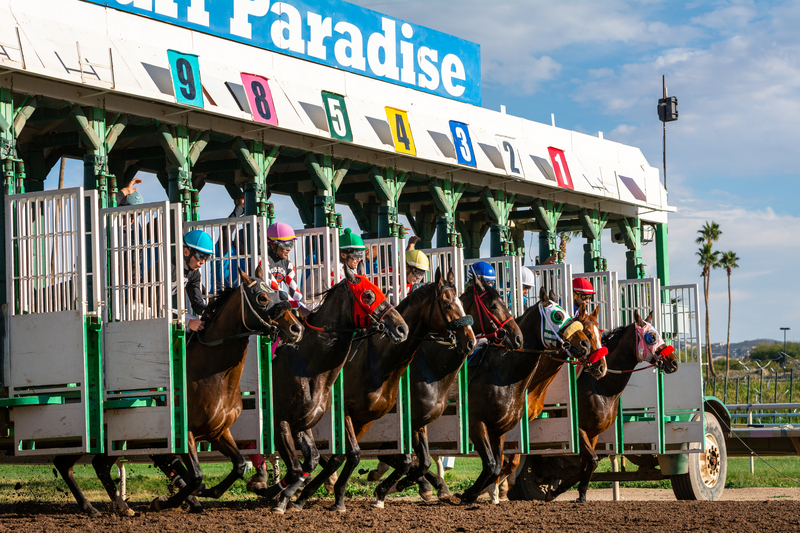 Turf Paradise is different: smaller, compact, short ways from parade ring to betting to food, drink and good viewing options. I was greeted by a super relaxed, serene and friendly atmosphere on the day. Sure, splendid sunshine always helps; nonetheless, this place has loads of charme: you’re close to the action, entry is free and fair food & drink prices make it a truly wonderful day out. There were only a few hundred or so people attending this mid-week race day. But as this is such a compact place, it didn’t feel lonely as it did at bigger tracks I’ve been to. The racing was nothing to shout about. Low-grade claimers and maiden races. In saying that, most horses turned out looked fantastically well presented. Nice in their coat, clean and fit! Unlike recent controversy accompanying the Breeders Cup and a certain French jockey (and something I certainly notice turning in for a bit of US racing in the evening on At The Races), there was no excessive whip use to be seen here – in fact, I felt the whip was used pretty sparingly and a lot of hands and heels riding was going on – to my surprise. 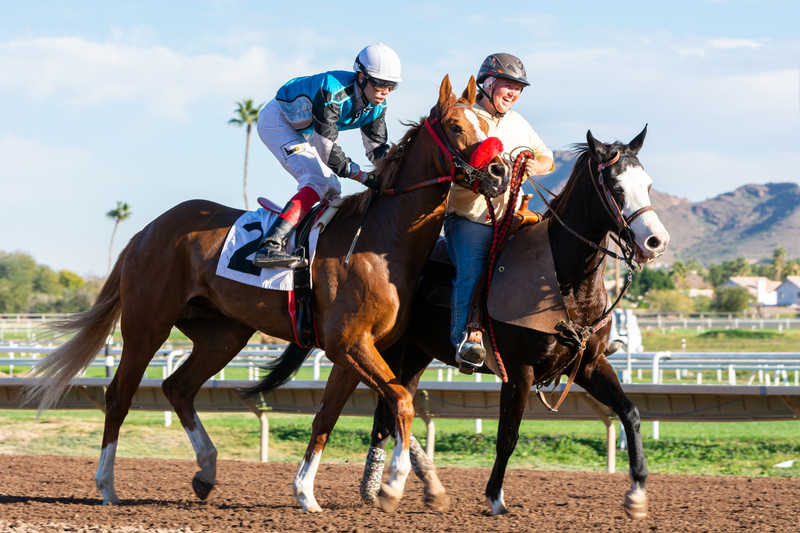 Unlike Aqueduct, Golden Gate Fields and Los Alamitos, If I ever have the chance again I’ll definitely go racing at Turf Paradise – I absolutely loved the day, where a card packed with 8 raced didn’t feel dull at any moment! CONGRATULATIONS! Rachel Alexandra and Zenyatta – two of racing’s most spectacular equine superstars of the past – have been inducted into racing’s hall of fame (to be precise: the ‘National Museum of Racing and Hall of Fame in Saratoga’). These two female racehorses, both at the peak of their craft in the one memorable year of 2009, never actually met at the race track, yet their stories are so closely intertwined as both captured the imagination of racing fans across the globe at the very same time. Unfortunately the eagerly anticipated duel of the two greats never materialised – never at a race track at least. Now, there’s a saying, though, you’re either in one or the other camp; a Rachel fanboy/girl or a Zenyatta fanboy/girl… it’s the ever ongoing discussion, the human battle of arguments for and against: who’s been the better one? You can’t have not an opinion. To say “ah well both are great horses” doesn’t cut it. So here’s my view on it. The short answer is: there can’t be a doubt Rachel Alexandra was the better horse! The long answer is: it’s not so easy. Zenyatta won plenty of races, won in awesome style and landed the Breeders Cup Classic – and take nothing away from her – she was an outstanding race horse. Yet, if it comes to sheer brilliance, resilience, determination, will power and of course the all important looks – Rachel wins hands down! 2009: it was her year: Unbeaten in eight races, five Grade 1’s, beaten the boys in the Preakness, Haskell, and Woodward as a three year old filly – this unparalleled campaign is probably only matched by all-time legend Sea The Stars! I can’t state enough that this is only my opinion. In this debate, I guess, there is no right and wrong. And I totally accept others in their view, claiming Zenyatta’s longevity of a career spanning over 20 races, with 19 victories, most of them in Grade 1 company, only marred by an agonisingly close defeat on the very last day of her career, give her the nod – and I agree, this was an outstanding career from an outstanding horse…. …. yet purely from an emotional point of view I never quite warmed up to her in the same way as I did to Rachel Alexandra. And isn’t that what racing is about? Beside everything else of course. But it’s not all about the betting, and the dream of making some bob on the nags – no, it’s also the sheer beauty of the sport when you witness these special creatures producing special moments. This special moment – when I fell in love with Rachel Alexandra – it was the first May of 2009, a hot summers day. It’s was been only a bit more than a year that I followed closely the sport of horse racing and back then I was still living in Germany. Still, I remember it vividly, sitting in front of the laptop, the grainy Racebets stream open – there was this ridiculously short priced favourite in the big race so I threw some Euros on Flying Spur, the second favourite. Not the wisest investment. Soon it become clear why there was this one filly, called Rachel Alexandra, three to one on in the betting – she slaughtered the field! 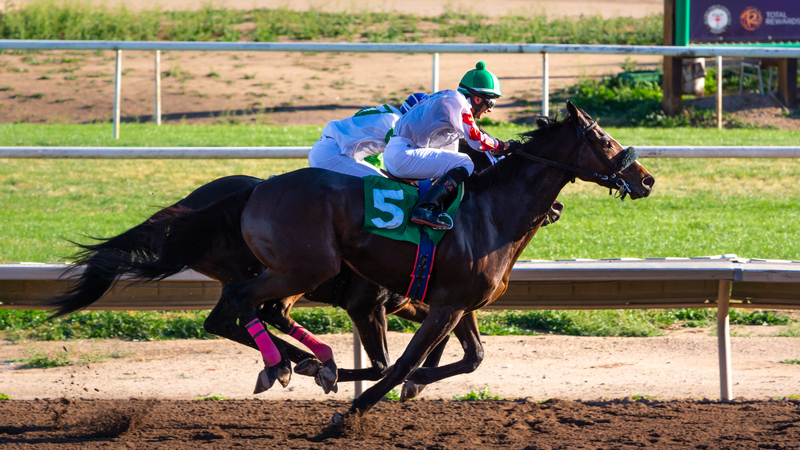 She turns for home and Calvin Borel glimpses over his shoulder, the rest of the field is labouring hard but his filly’s still hard on the bridle…. and then…. the ‘WOW’ moment I’ll never forget….. Still hard held, with every ease in the world she finds another gear, suddenly, so smoothly, she puts the whole world between herself and the rest of the field. WOOOOWW!!! Horses are special – Rachel Alexandra is extra special. She went on to produce more memorable moments the same year. In the Woodward, the Preakness and the Haskell, then against the boys, fighting through some gruelling finishes she came out always on top. It took a toll on her. The next season she clearly wasn’t the same. But who can begrudge her? She’s done it all, she showed the world how good she is, Rachel had nothing to prove. She gave us enormous pleasure – to ask her for even more would be greedy. And so she retired, as the one filly that I’ll keep close to my heart as a racing fan forever and ever. I want to end this piece with a recommendation to sit back, relax and enjoy this wonderful video below, showing all her big wins – it still gives me chills, even after watching it probably a hundred times by now. Rachel Alexandra: a filly for the ages!